I really don’t know what took me so long to post Kanchipuram idli recipe. One of my favorite idli variety that I must eat on every visit to Kanchi. Whenever we go for Lord Balaji’s darshan at Tirupati, we visit Kanchi too. Other than silk sarees, Kancheepuram is famous for its temples, Kanchi Kamakoti Peetham and of course the food. 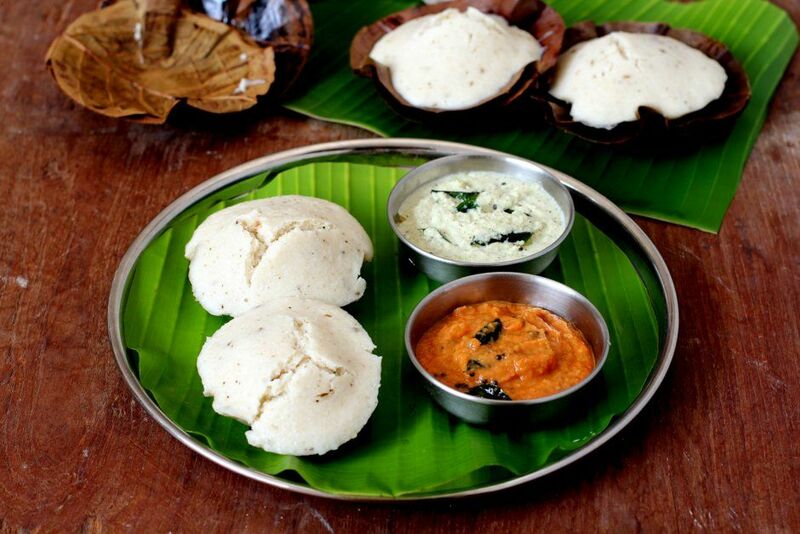 One of the most traditional Tamil tiffins or special food is Kancheepuram idli. This steamed delicacy is offered as prasadam at Sri Varadaraja Perumal temple. 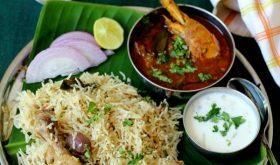 The food cooked in the temple kitchens and offered as prasadam to the Almighty has a flavor that cannot be replicated at home. Temple food is sacred with pure, clean flavors. Sattvik food at its best! One such temple food or koil neivedhyam is the Kanchipuram idli which also goes by the name kovil idli (temple idli), kudalai idli and tumbler idli. A healthy, heartwarming and filling breakfast dish. As a growing teenager, I was not fond of the flavor but in my adult years, my palate has matured. There are some flavors you enjoy as you grow older. 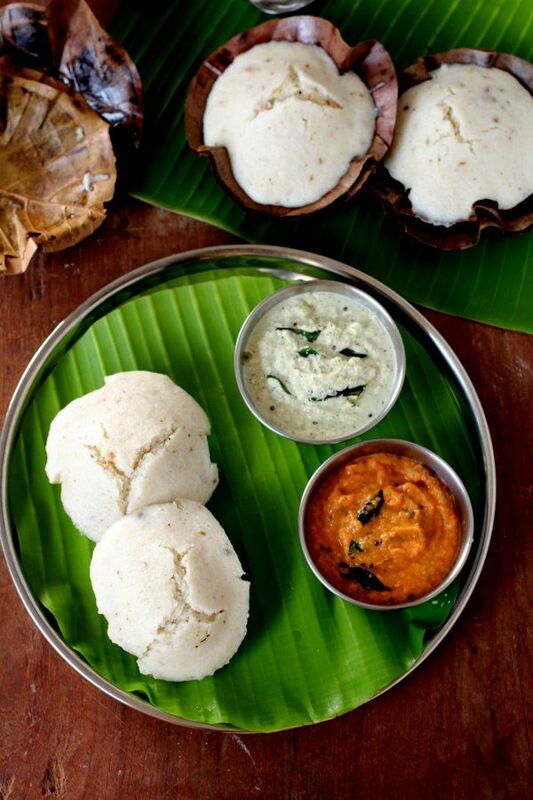 I relish the flavor and crumbly texture of the Kanjeevaram idli served in the temple. Over the years I procured quite a few recipes of idli varieties. I collected recipes from friends, hotel cooks, brahmin cooks at temples, magazines and the internet. The flavor of the kovil idli is not found in the any of the hotels of Kanchipuram. Each hotel has its own recipe of Kanchipuram idli. 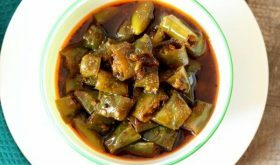 I have tried a few recipes and keep coming back to a recipe shared by an Iyengar Vaishnavite friend’s paati (grandmother). In fact, she shared quite a few Perumal kovil prasadam recipes with me. The food cooked in her kitchen is to die for, so enticing and brings joy to the soul. I shall blog them too. A unique idli preparation in terms of the idli batter preparation, the shape of the idli, the manner in which it is steamed and texture of the idli. 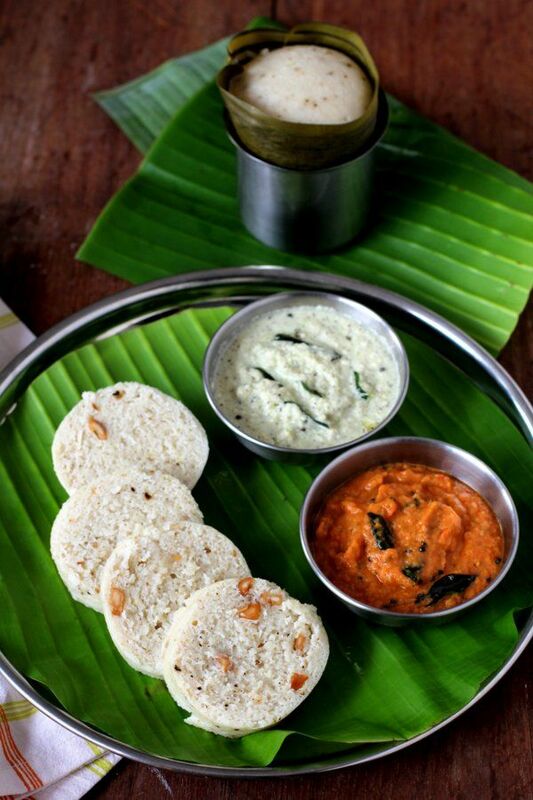 The side dish for Kanchipuram Idli can be kara chutney (a spicy tomato and onion chutney), hotel style coconut chutney, idli podi and tiffin sambar. And, I suggest you eat Kanchipuram idli while warm to savor its true flavor. Basically, raw rice, parboiled rice, and whole, skinned urad dal (black gram) are used in equal proportions. The rice (raw rice and parboiled rice) and urad dal are soaked in water separately for 5 to 6 hours. 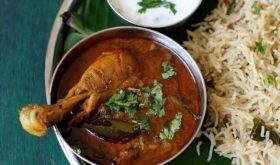 The rice has to be ground to a coarse texture (similar to semolina/sand) while the urad dal is ground to a smooth paste. Both of these batters are mixed together and the consistency of the batter should be neither thin nor thick. The batter must be sour so the idli batter has to be fermented for 8 hours (during summers). The authentic Kanjeevaram idli recipe does not call for tempering with mustard seeds and Bengal gram. We add coarsely crushed cumin seeds, peppercorns, and dried ginger powder (sukku podi/sonti podi) to the fermented idli batter along with ghee, gingelly oil, asafoetida, curry leaves and salt. But you can add a tempering of mustard seeds and chana dal also. I like to add broken pieces of cashew nuts that have been roasted in ghee. 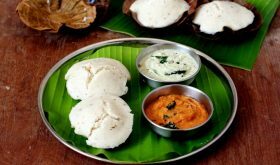 Traditionally, Kanjivaram idlis are steamed in dried ‘mantharai’ (kachanar/pulichinta/camel’s foot tree) leaf cups which lend a unique flavor to the idli. You can use banana leaves too. You can use a greased tumbler or a flat based round vessel (cake pan will do). Or you can steam them in the regular normal idli plates. Those of you looking for different types of idli recipes, you should give Kancheepuram idli a try. Do share your feedback and pictures of the dish in the blog comments or on social media. Would love to see them. You will find me on Pinterest, Facebook, Twitter, Google Plus and Instagram. Soak raw rice and parboiled rice in water for atleast 5 hours. Grind the rice to a coarse consistency (similar to rava/sand), remove and set aside. Grind the urad dal to a smooth paste. Mix both the rice and urad dal paste thoroughly. Place lid and set aside to ferment for at least 8 hours. The idli batter should turn sour. 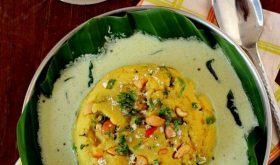 At the time of preparing Kanchipuram idli, heat ghee in a small pan and add the broken cashewnuts and saute till golden brown. Add the roasted cashew nuts along with the ghee to the batter. Coarsely crush the cumin seeds and black peppercorns. In the same pan, add gingelly oil, Once hot, add crushed cumin seeds and black peppercorns, asafoetida and curry leaves. Immediately, add this tempering to the idli batter. Next, sprinkle dried ginger powder and salt and mix to combine well. The idli batter is ready now. Pour some water into the steamer/pressure cooker. While the water is heating, grease the mantharai leaf cups with gingelly oil. Pour batter till half full and place on a flat plate or place in the groove of each idli mold. If using banana leaf, line a round cake tin with a banana leaf, grease it and pour idli batter till it is half full. Place in the steamer, place lid and steam on medium high heat for 15 to 18 mins or till done. The cake tin will take a longer time to cook (25 mins) than the mantharai cups. Remove the steamed idlis and de-mold from the cups and serve with kara chutney or any chutney of your choice. If you do not have parboiled rice on hand, use 2 cups raw rice. Ensure that you grind the rice batter that has a bit of grain. As you feel the batter between your fingers, it should feel like fine semolina. 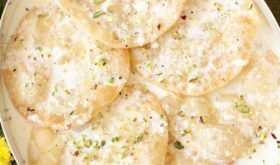 Vegans can omit the ghee. You can add mustard seeds and Bengal gram along with rest of the tempering ingredients. If you have used a cake pan for steaming, allow the tin to cool slightly, cut into wedges and serve. Soaking time is 6 hours. Grinding time is 15 mins. Fermentation time is 8 hours. Preparation and steaming time is approx 25 mins. This recipe serves 5 to 6 people. Really tasty Blog, keep blogging.